Thank you to all who participated. We are pleased to announce that your hard work, and that of your coaches, placed CdS 7th of 22 teams at this year’s zone meet!!! HUGE Congratulations to CDS diver, Henry Fusaro. Henry earned 3 silver medals at Jr nationals and a spot on the Jr World team. He will be heading to Russia in September where he will represent the US on 1 and 3m. At Sr Nationals he made it to the finals in the 3m competition, finishing 10th in the country!!! He also finished fifth in the Men's Senior Synchronized 3m Springboard Finals. Amazing performance. We're proud to have Henry on our team, performing so well and mentoring our young athletes!!! Here's the AT&T National Diving Championships Dives of the Day Video for August 16 2014. Henry is featured towards the end of the video around the 2 minute mark, but the entire video is worth watching. CDS Celebrates Big Wins at Age Groups, Junior and Senior Nationals!!! Emily Luberto dove at Age Group Nationals in the 3m 12-13 girls event. She did great finishing in 5th place in the prelims and also in the Finals! This isn't the first time that Emily has gone to this meet, and her performances keep getting better! Patrick Mullen also dove at Age Group Nationals in the 11u boys 1m event. With a 6th place finish in Prelims, and a 4th place finish in the finals, Patrick bettered his score and placement tremendously over the course of just one year! Henry Fusaro and his Jr's syncro partner from Texas, Christo Law, took the silver medal in the 14-18 syncro event. They finished 2nd in prelims and also in the finals. Henry and Cody both dove in the 16-18 3m event. Cody had the best finish he's ever had at a Nationals finishing in the top 30, with a score 30+ points higher then any other finish. Henry also dove well, finishing 2nd. The 16-18 boys 1m event went well for Henry also as he earned another silver medal. The 3m men's syncro event started off the events in the Senior National meet. Henry dove with his Sr's syncro partner, Tanner Wilfong. They needed to place in the top 5 of 8 teams to move on to finals. They did it, finishing in 4th place. The finals for that event are Sunday, August 17. From a field of 27, the top 8 divers in the men's 1m preliminary moved on to the finals held later that afternoon. Henry dove well, but finished in 9th place just .2, yes... 2 TENTHS, out of 8th place!!! What a heart breaker, but he did dive really well, and his score of 356.60 is very impressive for a 16 year old in that field of men. Henry's next event, 3m men's preliminary round, had a field of 30 men competing. The top 18 divers of this round moved on to the semi finals that were to be held later that evening. Henry's first two dives found him in 8th place. He hit a bump in the road on dives 3 and 4 and landed in 25th place with two dives left. He fought back, like a CdS champ, and finished in 17th place, just making it into the semi finals. This is the highest finish Henry has ever had at a senior National! 3 hours later, the Semi finals began where 18 divers were narrowed down to the top 12. Henry was focused, patient, and determined. He had a personal best high score on a twister, he nailed the two dives that had given him problems in the preliminary round, and he remained cool as a cucumber... he finished semi finals in 6th place and will dive in the finals on Saturday, August 16th. Thanks to Our Leader: Lia!!! The team recently surprised Lia with a big THANK YOU for all you do!!! And a HAPPY BIRTHDAY TOO!!! Thank you, Lia. We wouldn't be a team without you!!! The ADA Championships this past weekend went really well for CdS. We had 8 individual State Champions along with two new team records set and many personal record scores set. This couldn't be a better lead in to Summer Regionals being held in San Diego June 13-15. CDS Diver Emily Luberto Shines at West Nationals! Emily took 10th place in the 12-13 Girls 3m JO event this weekend. This was Emily's First EVER West National Championship Event, which is a HUGE accomplishment. Good Luck to Cody Rankin, who competes in the 16-18 Boys 3m J.O tomorrow!!! Henry Fusaro and Synchronized Partner Rock It At The World Cup Synchro Trials! CDS team diver Henry Fusaro and his synchro partner, Christo Law, from Alamo Area Diving in San Antonio, competed at the World Cup Synchronized Diving Trials in Tallahassee, Florida this past weekend. The winner of each event qualifies to Represent the USA National Diving Team at the World Cup held this summer in Shanghai, China. Henry and Christo placed 4th in prelims and came back later in the day to hold to their 4th place spot. Only 3 places away from 6 time Sr. National Champion Sam Dorman & Olympic Gold Medalist David Boudia who won the meet. Our Future Champion divers will be out in force this Saturday, March 22 at the EVDC Future Champions Invitational 2014. This event is sponsored by the East Valley Diving Club, and will be held at the Kino Aquatics Facility. If you're a FC diver, you need to be here!!! If you're not, you need to come out and cheer on our team!!! For more detailed information on the meet: Click here. Congratulations to CDS divers who participated in the Regionals!!! Thank you to everyone who came out to the region 9 meet. This was a great three days... Great diving, great helpers, great coaches... all in all a wonderful event! Check out the results: Click here. Congratulations to all our divers, coaches and families. The Spring Junior Regionals are almost here!!! Mark your calendars for March 7-9th, and join us in Mesa at the Kino Aquatics Facility for the 2014 USA Diving Spring Junior Region 9 Championships. Best of luck to all our JO divers participating in this event! And if your diver isn't participating, come out and cheer your fellow teammates on to VICTORY!!! Click Here for more info, and the event's official schedule. The Results Are In: CDS Scores Big In Tucson! Congratulations to all the divers and families who came out and participated in the Spring Fling in Tucson this past weekend. The weather was perfect, and the event was held at a beautiful facility. Needless to say, the CDS Dive Team was out in full force, doing what we do best! And we're very excited to announce that Clavadistas del Sol won the meet! As you can see, we came out on top in the Men's category, the Woman's category, and WE WON THE CHAMPIONSHIP TEAM AWARDS OVERALL!!! Way to go, Team CDS!!! Thanks again to the Tucson Diving Team for hosting the meet. We look forward to attending next year's event. Tucson Spring Fling is Here! Join us this weekend at the University of Arizona as the Tucson Diving Team hosts their Spring Fling! Come cheer on our divers, enjoy the weather and watch some amazing diving. February 15-16 at the University of Arizona. Our annual Cactus Invitational meet is coming up Oct. 11-13. We need EVERYONE'S help in order for it to run smoothly. So, please block those dates, not only for divers, but for parents as well. All families are expected to volunteer a small block of time. Please be on the lookout for a link for our volunteer sign up. if you are unable to make it to the meet, please let Lia know. We have a couple of jobs that need to be done now that will fulfill your volunteer commitment. Ski Pro to be on the pool deck Monday Sept 30 from 3:30-6. The suits will be in before the meet on October 11-13. Please make sure you come BEFORE your practice if you are in Gold, Silver or Bronze at 3:30. Lessons 1 & 2 please wait until 4:30 so the other groups can get fitted before they practice. We want everyone looking sharp for the meet on October 11-13! Looking forward to seeing everyone at the pool! Best Wishes to Seniors Marlee and Lauren! The CdS family extends best wishes for the future to Senior divers Marlee and Lauren! They will be missed! The month of August is a half month for us. We will be on break from August 18th-September 2nd, starting up again on the 3rd. Coach Josh will be traveling with divers who qualified for Jr. and Sr. Nationals which are being held in Minneapolis, Minnesota, and Iowa City, Iowa, from Aug 2-18. He gets his “summer break” after this 2 week period of travel. Additionally, this gives our divers an opportunity to readjust to school. Henry and Cody both qualified to go to Jr. Nationals (Cody for 16-18 3m, and Henry for 14-15 1m, 3m, and 3m synchro). Henry also qualified to go to Sr. Nationals for 3m and 3m synchro. If you see them on deck, I know they will appreciate any and all encouragement you have for them. They’ve worked really hard; let’s show them how proud of them we are! Henry leaves on the 2nd, and Cody will be leaving on the 7th. CdS' Future Champions bring home "hardware" from Flagstaff! The annual 'Diving in the Pines Invitational' was held in Flagstaff this weekend and CdS had some of our finest "Future Champions" competing in many different events. We had a lot of success including several Gold, Silver and Bronze finishes. Congratulations to all of you who went and competed. CdS thanks you for competing and making our team the best around! Henry and Cody are back from Jr. West Nationals in San Antonio. Cody dove very well in the most competitive age group contested, the 16-18 boys 3m event. This was his first time diving at West Nationals in this age group. His most solid dive at the meet, a reverse 2 1/2, was a dive he learned just 10 days ago! Way to go, Cody! Coach Josh had the honors of awarding the medals for the top 12 finishers in both the 1 and 3 meter 14-15 boys events as Henry earned his 6th and 7th Jr. West National championship titles winning both boards. Cody and Henry are not just great divers, but they are a wonderful example to the younger kids on the team and we appreciate it. Congratulations to you both, and Coach Josh, for a wonderful performance and thank you for representing CdS! Cody Rankin and Henry Fusaro are in San Antonio for the USA Diving Jr. West National Championships. Cody is diving on 3m and Henry is diving both boards. The competition is great, and both boys seem relaxed and are having fun. Can you find them in the picture above? This was the open warm up on Thursday! CdS is back from Region 9! Our team had 14 divers competing in 23 events. Seven of those 23 events were competed in for the first time in a Regional competition. CdS divers in 10 of the 23 events earned personal best performances! We had 3 divers make finals (top 12) and medal in their events. Congratulations to Margaret Miller, Cody Rankin and Henry Fusaro. Henry Fusaro became a double Regional Champion in his age group, and a West National qualifier. CdS wins Tucson Spring Fling! 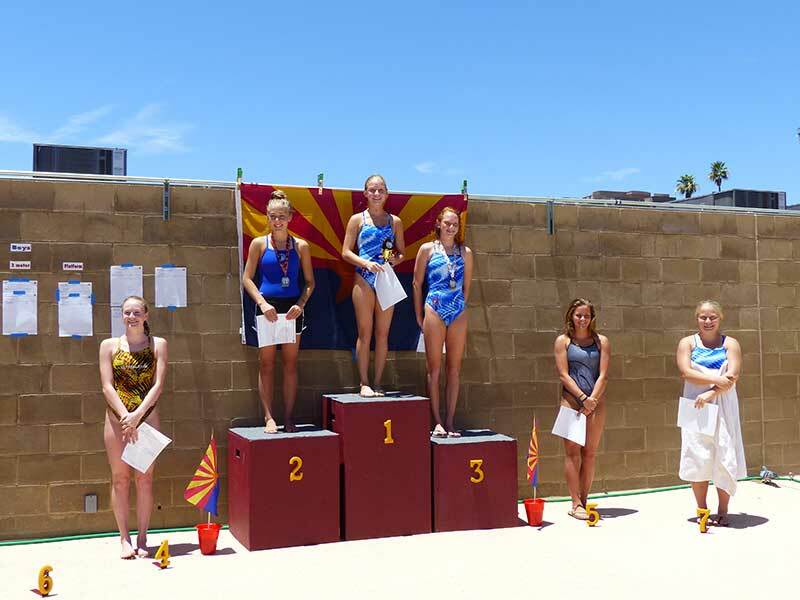 Congratulations to all of the CdS divers who participated in the Spring Fling last weekend in Tucson. Everyone did a great job and it paid off... CdS won 1st place over all, 2nd place in the team awards for men, and 1st place in the team awards for women! Cody Rankin was the high scorer for the CdS men, and Nicole Falls was the high scorer on the womens side. CdS will be on a break until September 4th. Please check the diving schedule as there have been some changes that take effect in September. Mike Bidak and Henry Fusaro head to the USA Diving Sr. Nationals! Congratulations to Mike Bidak for winning the 1m event at Sr. Zones in Misson Viejo earlier this month to earn a spot at Sr. Nationals in Greensboro North Carolina. He will be joined by Henry Fusaro who qualified for the 3m Sr. National event when he finished 6th at Sr. Zones but was bumped into the qualifing spot when a top 5 finisher was unable to attend the National meet. CdS thanks you both for your hard work and representing us in Greensboro! Mike will compete 1m on August 14th and Henry competes 3m on the 15th. Mark your calendar!!!! Make sure you come ready for good food, ping pong, swimming and "DIVING JEOPARDY!" Hosted by our very own Coach Josh! Thank you Age Group, and Jr. and Sr. National Championships competitors! A big thank you to Emily, Henry and Mike for representing CdS in NC earlier this month! These three divers had fun, dove great, and learned so much on this trip. It goes without saying that they conducted themselves in such a way that we should all be proud of them! Emily Luberto heads to Age Group Championships! Let's cheer Emily on as she heads to Greensboro, NC for the 2012 USA Diving National Age group championships. Emily will compete her 1m event on August 1st and 3m on August 2nd. Emily earned her spot at USAD Zones championship in Riverside earlier this month when she finished 12th on 1m and 10th on 3m. CONGRATULATIONS EMILY... RIP IT UP! CdS thanks you for representing our team for us. Henry Fusaro heads to Jr. Nationals! Give it up for Henry as he heads to the 2012 USA Diving Jr. National Championships in Greensboro. Henry was prequalified for the 1m and Tower events and qualified for Nationals on 3m at Jr. Zones in Riverside earlier this month. He will head to North Carolina with Coach Josh on the 3rd. He competes 3m on Aug 6, Tower on Aug 7, and 1m on Aug 9. TEAR IT UP, HENRY! Coach Josh and the rest of the CdS Board would like to welcome you all to the team. Be sure you bring your paperwork to the pool deck on Sept 1, and get registered with USAD as AFTER AUGUST 1.